Can I select more than one resource for the same item? Yes! You don't need to do anything to get multiple resources to work in Google calendar. DayBack essentially lets you add new fields to Google calendar and Resource is one example of that. Look for the ability to define your own custom fields for Google calendar in forthcoming updates to DayBack. DayBack currently supports multiple resources (and a single status) per Google event. Note: You can drag an event on the Resource view from one resource column to another; when you do you'll be swapping out the new resource for the resource you dragged from. Other resources for the event remain intact. Do Salesforce records support more than one resource per item? Can I treat both people and rooms as resources? Absolutely-- this is one of the most common setups for DayBack. How you set this up will depend on where the resources are recorded in your Salesforce object. Some of my objects use "owner" for person, and some use another field for "room"
(My objects each have one resource field) This setup requires no special configuration, though you'll likely want to create a resource folder for people and another for rooms. If the field you're using for "room" is a long text field or a multi-select picklist you'll be able to associate multiple resources with the same item. Within the same object, one resource is the activity owner, the other is a custom field for "room"
(One of my objects has two resource fields) In this scenario you'll create two calendar sources mapped to the same table: one will use the owner as the resource field and the other source will use the room. You can then turn on the first source (let's say you've named it "Activities by Technician") to view your assignments by person, and show just the second source ("Activities by Room No.") to view them by room. Again, you'll likely want to create a resource folder for people and another for rooms. (My object has one resource field that will contain more than one entry) This is by far the simplest setup and the easiest for users when they are working with the schedule. In the event popover, users can simply shift-click when selecting resources for an item to associate more than one resource with it. In your resources field these multiple resources will be written as a semicolon separated list in your Salesforce object's resource field just as if they were entered in your picklist. Simply shift-click when selecting resources for an event to associate more than one resource with the event. 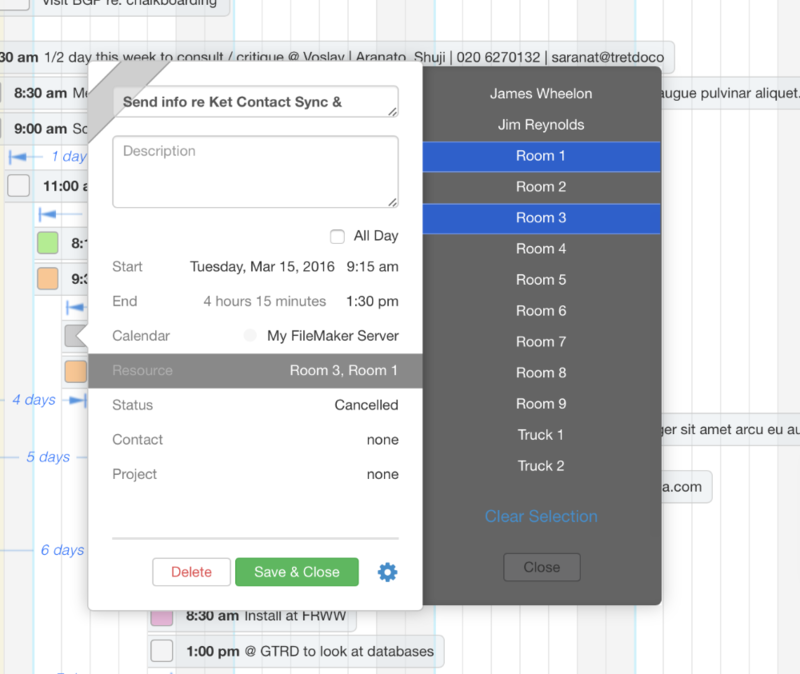 In FileMaker, these multiple resources will be written as a return-separated list in your FileMaker table's resource field. DayBack requires the field you've mapped to "Resource" be the name of your resource, but if you're using IDs as well you can set up your ID field to lookup the resources' IDs based on the names entered in the field you've mapped to "Resource".